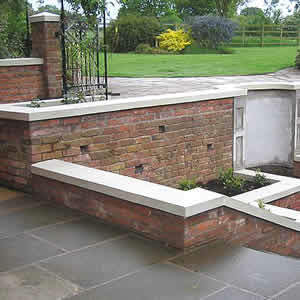 We have a wide selection of coping stones that are used as an alternative to bricks on edge. They are designed to keep the water from entering cavity walls, or just to add a feature to an otherwise plain wall. The width of the wall you need to cover with the coping stone. The length of the wall you need to cover with the coping stones. All our coping stones come in lengths of 600mm, this makes them easy to handle and easier to fit than longer length stones. We can make most of our coping stones to a varied base width, so if we don't list the size you need we likely can make it! A once weathered coping stone means the stone has a gradient off to only one edge of the stone. These are most commonly used around parapet walls. The water runs off to the back edge and then falls behind the wall. When using this style of coping stone you will usually require an overhang with a Drip groove cut into it, we recommend 25mm per side of overhang to allow for this. Examples of these stones from our range are E2, E3, E4, F3 and F4. Please click here for different sizes. A twice weathered coping stone has a peak (usually in the centre) that allows water to run off to both sides of the coping stone. Again, when using this coping stone style you will usually need to have an overhang for a drip groove to be used. This style is most commonly used on garden walls, and gable ends. An example of this stone would be an F1 and F2, the D1 Coping stone also needs fitting with an overhang. This is our most popular style of coping stone. It has the peak in the centre like a normal twice weathered coping stone, but also has decorative sides. This stone needs to fit flush to the top of the wall, the drip on the stone is incorporated into the decorative sides. It is most commonly used on garden walls, and around patio areas. An example of this stone is the D3, D4 and E1.